Garlic basil marinated chicken breasts baked alongside fresh tomatoes and finished with mozzarella cheese. This garlic basil baked chicken breast recipe is easy to make and comes together quickly. Jump to the Garlic Basil Baked Chicken Breast recipe or read on to see how we make it. 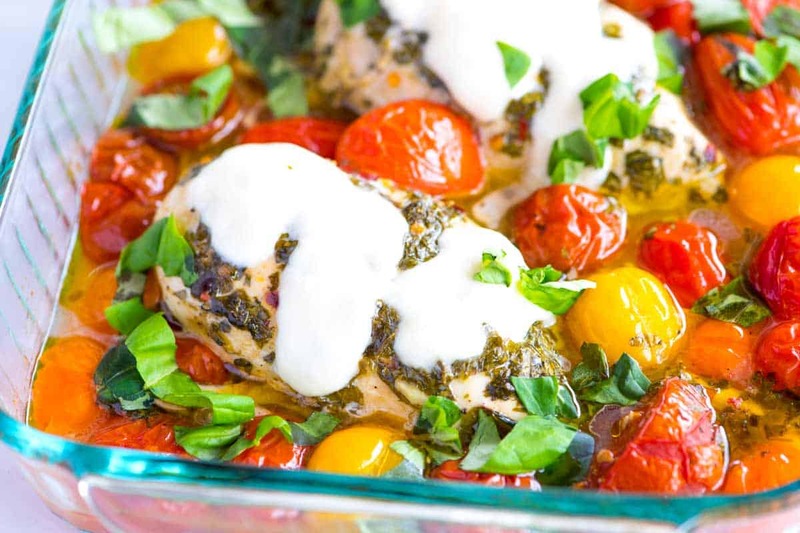 This baked chicken breast recipe with tomatoes has quickly moved up to one of my favorite ways to cook chicken! When it comes to skinless, boneless chicken breasts, there are three secrets for making sure they come out juicy, tender and full of flavor. We shared our best tips for baking chicken breasts in the oven a few days ago. It really comes down to three things: marinate, bake loosely covered, and use a meat thermometer. If you’re on the lookout for more chicken breast recipes, take a look at these: Lemon Garlic Baked Chicken, Lemony Chicken with Cucumber Feta Salad, and Baked Chicken with Roasted Red Peppers. 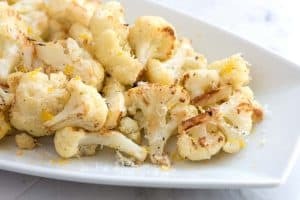 This is a simple recipe, but it is packed with flavor. 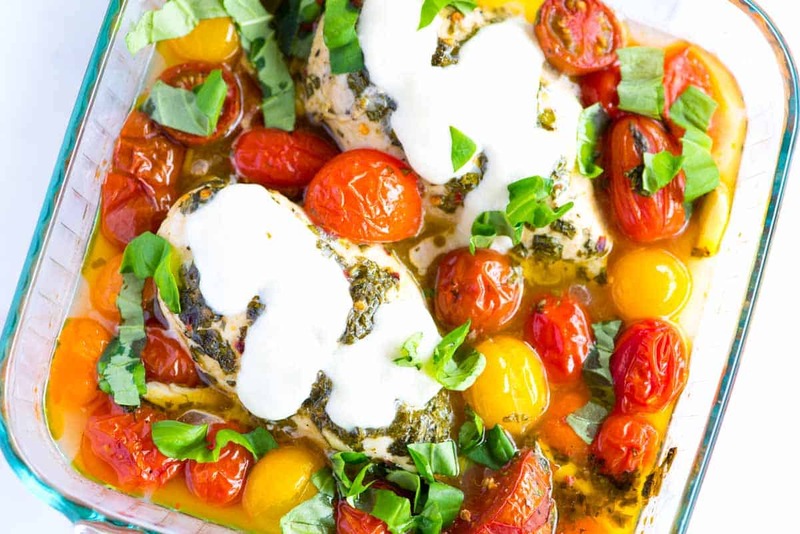 Chicken breasts are marinated in a simple, yet magical marinade and then baked alongside lots of tomatoes and basil. Just before serving, we add a few pieces of torn fresh mozzarella cheese. We start with the marinade — it’s a simple combination of red wine vinegar, olive oil, garlic and basil. Fresh basil is key — dried just won’t do it, here. We only marinate chicken breasts 1 to 2 hours — you really don’t need to go longer than that. After the chicken has marinated, move on to the tomatoes. Use a variety of cut tomatoes and whole small tomatoes. The cut tomatoes give up their juices quickly and the cherry tomatoes stay intact. 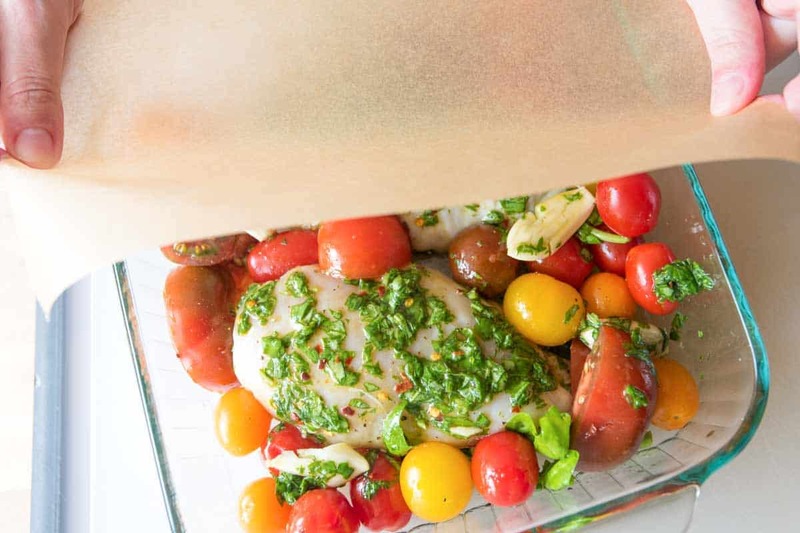 Add the tomatoes to a baking dish with basil stalks — we used the leaves to make the marinade. You won’t end up eating them, but they are really fragrant so use them. We use basil stalks often — especially when making tomato sauces. We add basil stalks to this slow cooker tomato sauce. It’s delicious! Time for the chicken — just nestle it in to the dish. The tomatoes will build up the sides — that’s perfect. Then we bake — bake loosely covered and get your meat thermometer ready. We’re looking for 165 degrees F, no more than that. After 35 to 40 minutes the chicken should be done and it’s time to add a little mozzarella — because let’s be honest. Basil + tomatoes + mozzarella is amazing. Oh, and that juice at the bottom of the baking dish? It’s pure gold! I would happily spoon it into my mouth everyday. A big piece of focaccia bread to sop it all up would be a nice idea, too. As I mentioned above, this baked chicken breast recipe has quickly moved up to one of my favorite ways to cook chicken and I’m betting it will for you, too. For juicy, tender chicken breasts remember these three things: marinate first, bake loosely covered, and use a meat thermometer. In our photos, we show baking 2 chicken breasts, but the marinade shared below is enough for 4 chicken breasts. The chicken does not need to be completely immersed in the marinade, just coated by it. If you plan to double the recipe, simply double the amount of chicken, tomatoes, and the mozzarella. We marinate the chicken breasts in a magical mixture of red wine vinegar, garlic, and basil before baking in the oven. 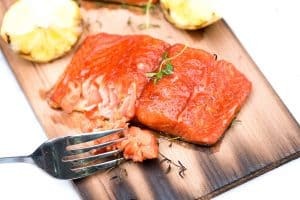 If you’re short on time, marinate as close to an hour as you can. If you’re flexible, go for a whole two hours. The flavors will intensify. And since we want to keep things safe, it’s best to marinate the chicken in the refrigerator (no matter how long you do it for). Remove basil leaves from stalks and set the stalks aside. Roughly chop the basil leaves so that you have about 1/4 cup. Whisk 2 tablespoons of olive oil, red wine vinegar, red pepper flakes, 1/2 teaspoon salt, and a 1/2 teaspoon of black pepper together until the salt has dissolved. Stir in the garlic and basil. 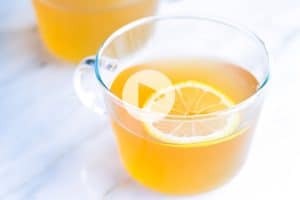 Refrigerate and use within 1 to 2 hours. 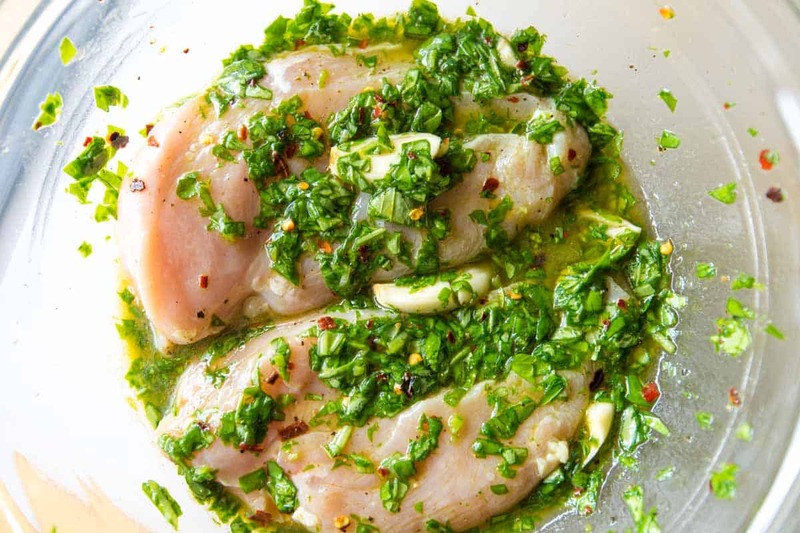 Add chicken breasts to the marinade and marinate for 1 hour and up to 2 hours in the refrigerator. Position oven rack in the middle of the oven and heat the oven to 400 degrees F. Lightly oil one side of a sheet of parchment paper that is large enough to cover the baking dish. (Aluminum foil can also be used). Add the basil stalks set aside from earlier to a baking dish large enough to fit the chicken breasts arranged in one layer. Add the tomatoes then toss with 1/2 a tablespoon of olive oil and a pinch of salt and pepper. Nestle the chicken breasts down into the tomatoes, allowing the tomatoes to gather up the sides of each chicken breast. Throw the garlic cloves from the marinade into the baking dish then cover the dish with parchment paper. Loosely tuck the parchment paper around the chicken. Scatter mozzarella on top of each breast then broil on high for about a minute or until the cheese melts. 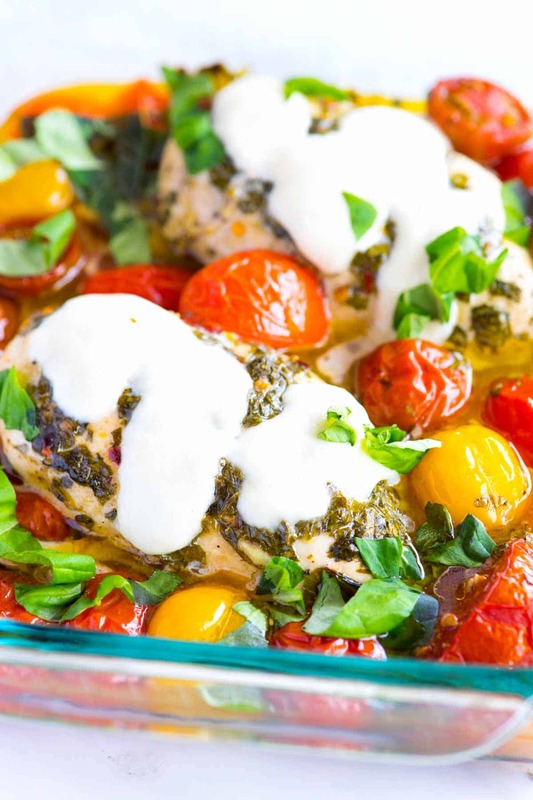 Serve the chicken with the baked tomatoes, juices from the bottom of the baking dish, and more torn basil leaves. You guys are amazing. 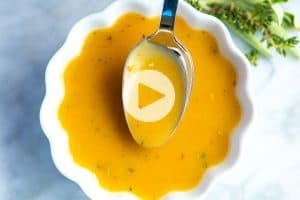 I have never had a recipe from this website go wrong. I’ve been wanting to try this chicken for a few weeks now (my boyfriend was already tired of hearing about it). I finally got to it today. It was absolutely delicious. I only had about 45 minutes to marinade it, but still it was full of flavor. Next time, will go for the full 2 hours of marinade. I also forgot to double the amount of tomatoes, since I used 5 pieces of chicken breast. My boyfriend loved it. Said it was perfect and even better than the other recipe (I made the one with lemon, garlic and mustard a few times). Thanks for sharing these amazing whole foods. We loved it. I served it over an arugula salad lightly dressed with olive oil,lemon juice, salt & pepper and shaved parmesan. To do it again I may try topping the chicken with parm instead of fresh mozzarella. I made this recipe last night without the cheese and only marinated the chicken for an hour. Even so, my husband loved it! The juice in the bottom of the pan was so good that I didn’t want to stop eating it, after my two pieces of bread were gone. I will definitely cook this one regularly, and I’m excited about trying more of the recipes! Delicious! Everyone loved it. Super easy too. Great recipe when you need to use lots of tomatoes. Followed the recipe exactly. Just used 2 tbsp ready minced garlic instead of cloves. Cut up regular tomatoes instead of cherry tomatoes. Thank you! This chicken breast is bursting with flavor. I want it right now!